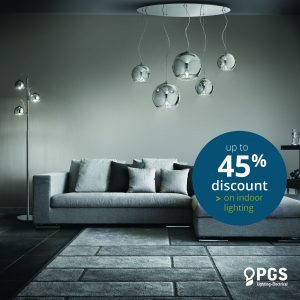 PGS Ligthting Electrical gives you the opportunity to bring a light of revamping to your house with up to 45% discount on all indoor lighting fixtures. From November 1st until the end of the month, you will have the chance to benefit from the discount offered to renew every room of the house. Featuring a wide range of high-quality lighting fixtures from famous Italian, Spanish and other European brands, PGS Lighting Electrical offers lighting solutions for all tastes. Whether you want to give a modern and minimal feel to your place, or a more classic or vintage touch, you will be able to discover many different ways to accentuate the features of each room while making it brighter, more functional and stylish. Additionally, PGS’ lighting consultants will give you tips and ideas to help you choose the suitable lighting fixtures according to your space and needs. There will also be a ‘hot deal’ section in the stores, where floor lamps, table lamps, wall lights and pendants will be available at even lower prices. With five lighting showrooms all over Cyprus, PGS Lighting Electrical offers integrated lighting solutions while ensuring the quality and uniqueness of its products.